← Hot Dog Race Cars. Mile Me Deaf Sound Really Good To Me. I saw this chicken recipe while surfing around the internet. The photos looked amazing, too. What sealed the deal for me was that there were 1160 comments. So I made the chicken and I loved it. We polished off every last bite. (Note that the recipe serves 3 only…definitely double it). 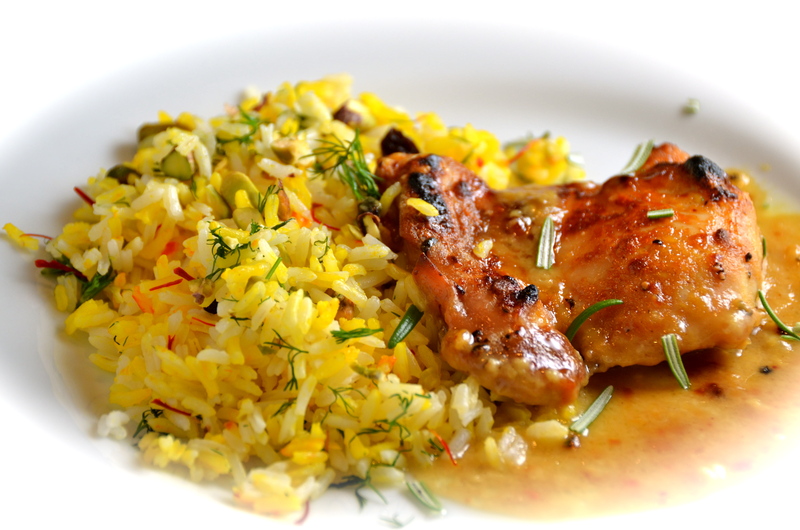 I served my ‘Man-Pleasing’ chicken with a rice dish that pleased my man. 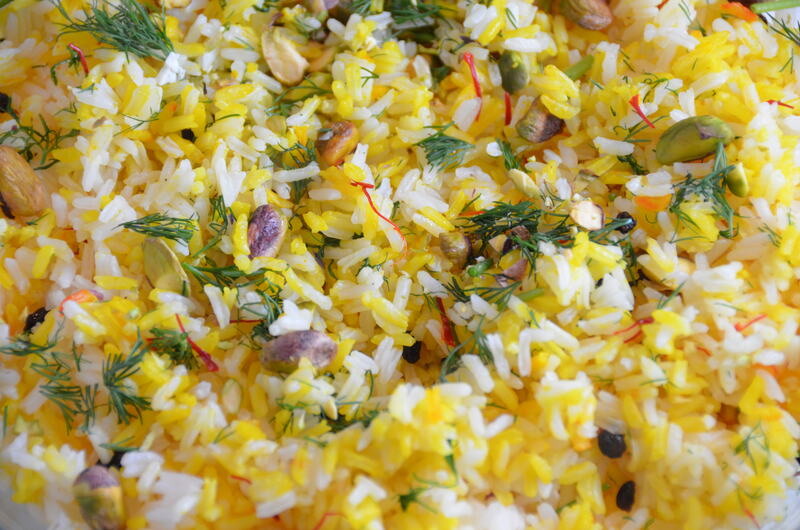 The Saffron, Pistachio and Mixed Herb Rice tastes just like it sounds. 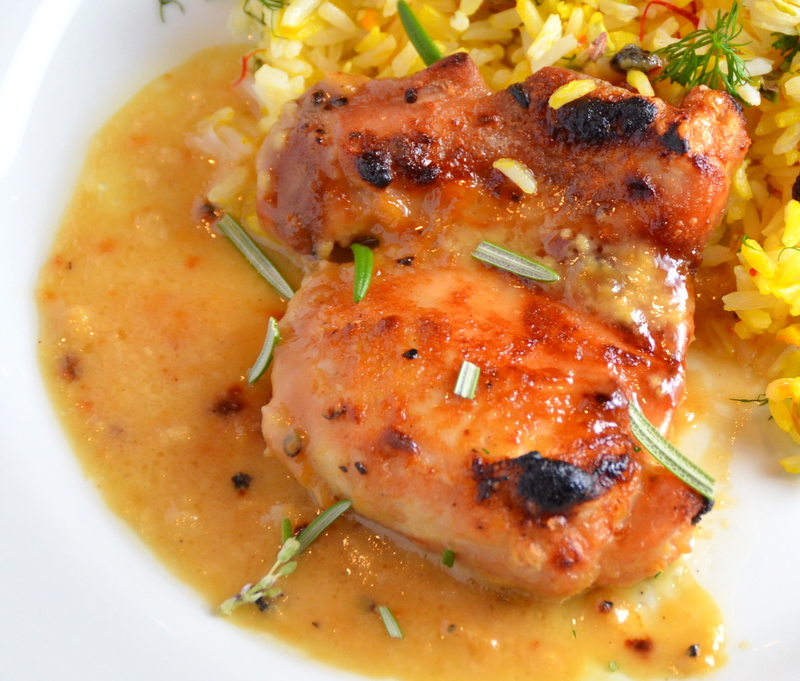 Packed with flavor and crunch, it is a divine accompaniment to the chicken or anything else. 2. Mix together Dijon mustard, maple syrup, and rice vinegar. 3. Place chicken thighs into a foil-lined baking dish. Season with salt and pepper. 4. Pour maple mustard mixture over the thighs, turning chicken so that it’s fully coated. 5. Put the chicken thighs into the oven, and bake for 40 minutes or until cooked through. Baste the tops of the chicken with more sauce half way through cooking time. 6. Let the chicken rest for 5 minutes before serving. Spoon some extra sauce over the top of chicken and sprinkle with snipped fresh rosemary. 1. Melt the butter in a medium saucepan and stir in the rice, making sure the grains are well coated in butter. Add the 550ml boiling water and the salt. Mix well, cover with a tight lid and leave to cook on minimum heat for 15 minutes. 2. Meanwhile, soak the saffron in 3 tablespoons of boiling water and set aside. Place currants and sugar into a small saucepan of boiling water, remove from the heat and leave on the side. 3. Remove rice pan from the heat and pour the saffron water over the surface of the rice. Cover the pan immediately with a tea towel and place the lid tightly over the towel. Let sit for 5 minutes. 4. Transfer the rice into a mixing bowl, fluff with a fork and let cool for a few minutes. 5. 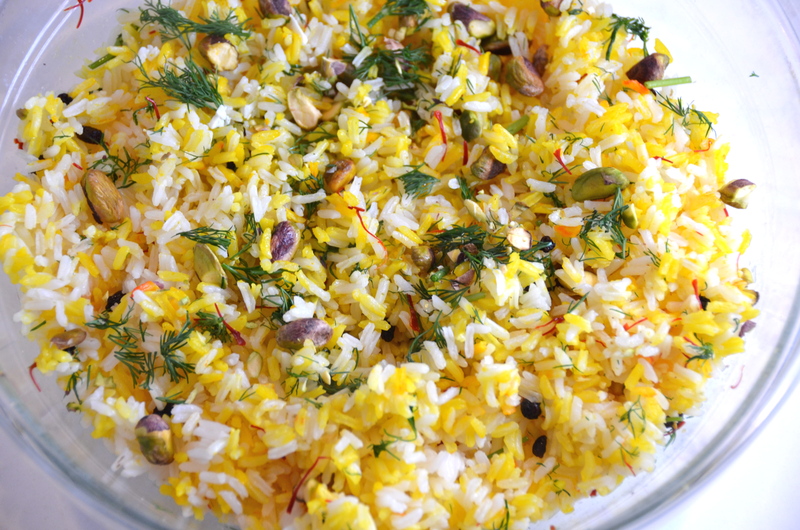 Drain the currants and stir them into the rice along with the herbs and most of the pistachios, reserving some to scatter on top when serving. Serve rice warm or at room temperature. How about Half A Chicken with Happy Story? 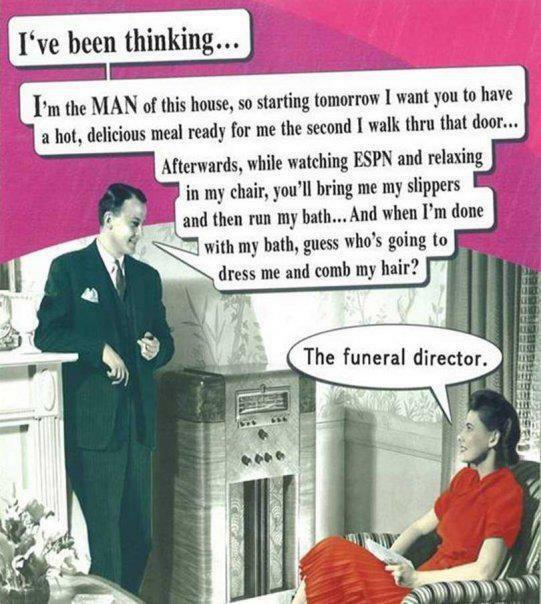 That about sums up today’s man-pleasing recipe. Check out Half A Chicken on Facebook and Bandcamp, where you can get the music. This entry was posted in Chicken, Main Courses, Side Dish and tagged Half A Chicken. Bookmark the permalink. Made this last night, and it disappeared..good thing I had doubled the recipe! 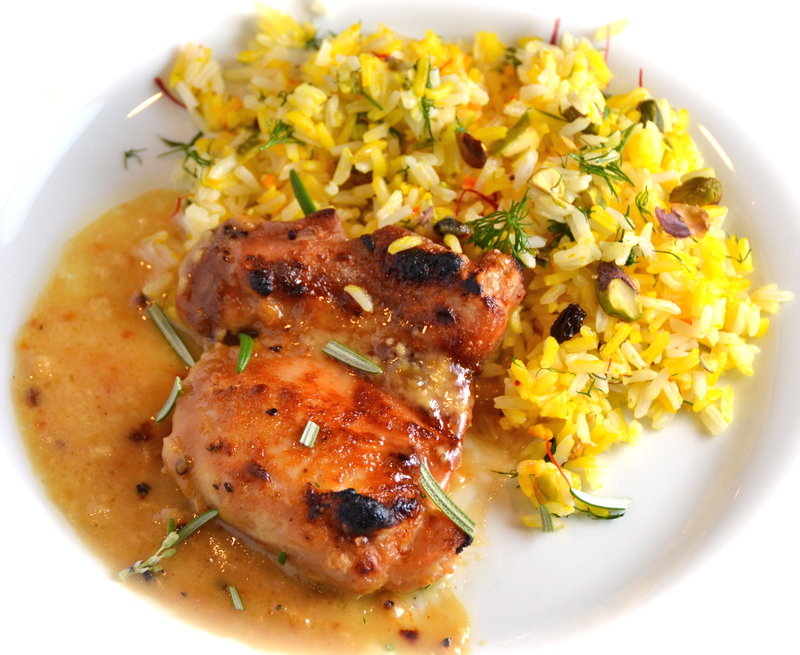 Used chicken breasts, since that is what I had on hand….Thanks! I bet the sauce would be good on any kind of chicken…and pork, too. I’m so glad that you liked it. Made this last night for dinner – yummm! Glad I took your advice and doubled the recipe – this is now a new favorite and I have already had a request for it as a birthday meal – it was that good – and oh so easy!! Thanks Tricia for another great meal outside of our usual! Keep up the great work with this wonderful blog! !